On Thursday 30 March NICe played host to a visit from the Cooper & Turner Group, one of the world's leading manufacturers and distributors of industrial fasteners for the Construction, Wind, Tunnelling, Rail, Oil & Gas and OEM markets. During their visit, Lee Rodgers the business manager for their region was able to demonstrate a range of new product developments and applications being run on the latest machine tool platforms. 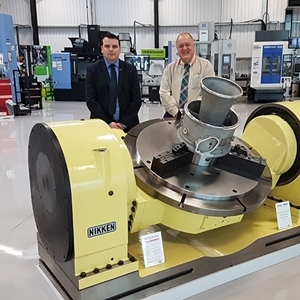 Charles Toyne, Continuous Improvement Manager for Cooper & Turner commented on how worthwhile and impressive the visit had been – “as an established industry leader it has been great to come along and witness the new technology and range of products on offer from NIKKEN. It has given us a chance to have an update on capabilities and identify potential areas for collaboration on future projects – it’s always good to keep in touch with the latest developments”. Pictured are Lee Rodgers, NIKKEN Business Manager and Charles Toyne, Cooper & Turner Continuous Improvement Manager.